Yesterday, I met up with Kerry-Anne, my is crafting buddy, we've been good friends and met through my ex. 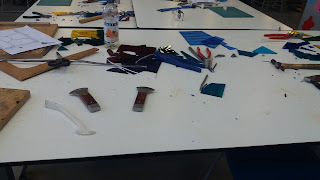 We both share a love of crafting and sampling different arts, Kerry- Anne suggested trialling out stained glass. We trialled glass techniques before, where we made glass bubbles by blowing glass and adding colourful pigments. 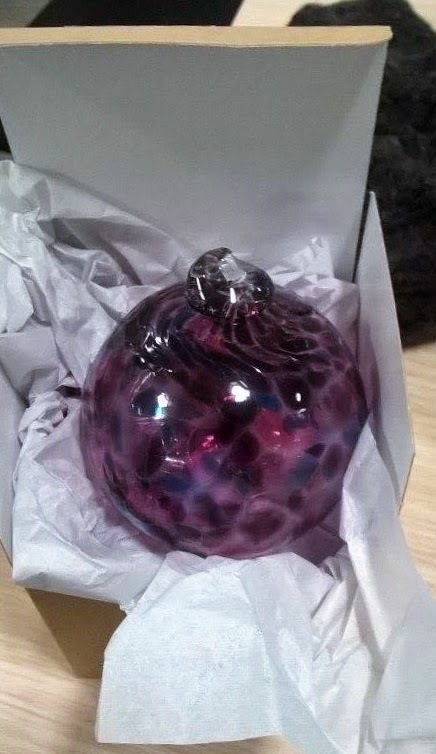 Below is the bauble I made the last Christmas. Making stained glass is completely different in comparison to blowing glass. It's more labour intensive and more dangerous when cutting glass goes flying around and risk of cutting a finger or burning finger off soldering. We had fun making the glass. However, it was frustrating attempting to cut the glass and Kerry- Anne appeared to of mastered the craft easier than I did. She seemed made a perfect stained glass piece but confessed it was difficult. For my item, I kept needing assistance from the tutor, as I started made the Sun first and very curvy, certainly the most difficult to cut.out. Most my pieces never seemed to cut correctly, and difficulty in cutting the led. I felt like the special kid in the class that was struggling but again I always feel like that it takes me a couple attempts to learn new techniques. We arrived and provided with a simple design of a sun and fields.We chose the colours for the design; we had to scratch the glass following through to the edge to edge. A line the cutter on the scratched line and press down and separated the glass. There were nibbles to neaten the edges. The glass was cut and laid onto the template. The lead had to be straightened out as was bendable one but it was so malleable and bend into shape quickly. 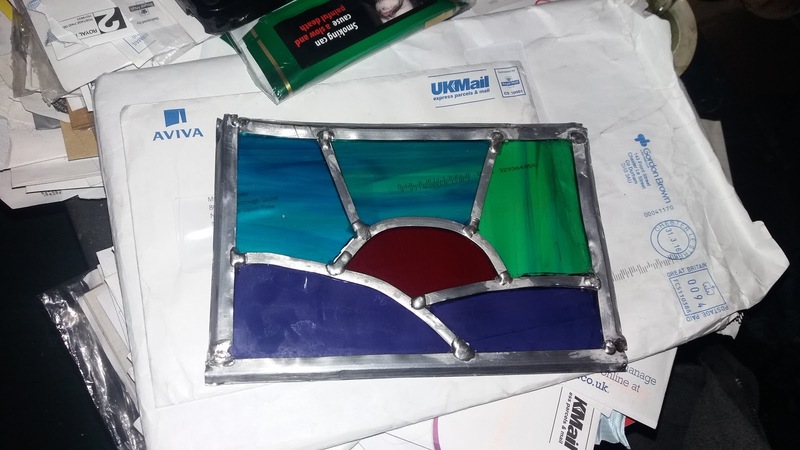 The larger pieces of lead were moulded to fit around the edges of the stained glass, and the thinner pieces were used to for the inner edges. This process was laborious and fiddly to complete, as it meant the glass pieces needed to neaten to place them in the window. All the glass joints were had to be scratched with a wire brush and rubbed with tallow. The edge was soldered together. The tutor was very friendly, but direct went straight into instructing how to make the stained glass as there was a group of twelve. The instructor explained typically only ten people attended, and any more than this is hard to teach. The tutor made everything looked easier when displaying the techniques. Through the afternoon, she was cordial and chatted about her experience. Kerry-Anne suggested about enrolling in the intermediate class; I explained I would like to do another beginner class befoe considering it, I think it I would beneficial attending another beginners course. 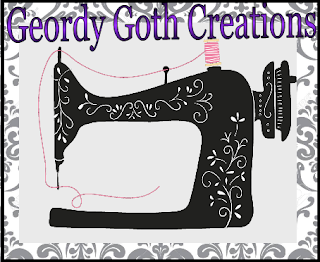 The tutor mentioned she had another design available if we were interested. I enjoyed completing the course despite the difficulties I encountered. I think attending the session with a friend made it more enjoyable as we chatted and laughed at our mistakes. It meant we were spending time together and learning a new craft. One best things were at the end of the session we had something to take home rather than collecting it again. I'm surprised at the lack of cuts, usually, I'm so accident prone. It looks great! I think you do it totally different over there than we do here. We wrap each piece of glass with copper foil and then solder the whole thing instead of using lead caning. We also get to use a grinder to neaten up the edges which is nice and fast. Thanks for your kind comments. I thinks its interesting that different countries use different materials. I think a couple of classes I would it would perfect my skills. I enjoyed doing it, as its something completely different in comparison to what I have trialed. I love the glass bubble and the stained glass! 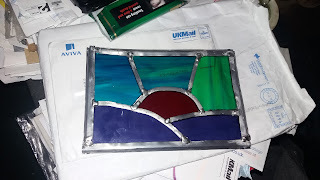 I have a facebook friend who is an actual stained glass window maker and fixer! I can't imagine the work that goes into it! I would love a stained glass window of my own! Beer and cider festival and silly hats.